The Company Name and Address will automatically populate for you. The Company Name can be edited and will be displayed in the upper left hand corner of the screen. Corrections to the address information can also be made here. The Last Assigned Work Order Number defaults to 99, which assigns the first work order created as Work Order ID 100. This number can be adjusted in the initial setup, however it cannot be set to a number below 99. The Maintenance Emergency Phone Number, Pager, and Contact information are optional fields. Comptroller shows the user currently listed as the Work Order Comptroller. For more information about the Comptroller function, see Work Order Users. Define the name for Your Work Order Custom Category Label here. The Custom Category is a reportable field available to track any additional information important to your organization. The Purpose Code fields are used when your organization owns other Dude Solutions products in addition to Work Order. These purpose codes will automatically populate on work orders created from your other Dude Solutions applications and are color coded to each product. The Work Order Form can be printed in one of four different formats. Select the form you would like to use from the drop down box. 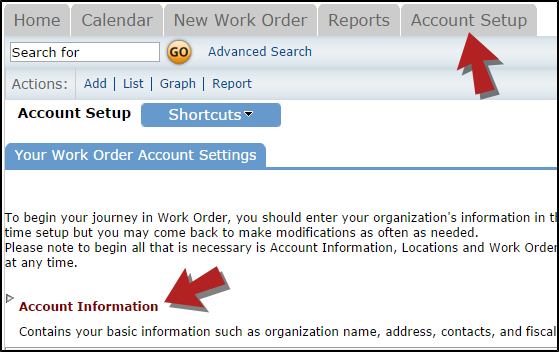 *Note: Once there is a work order in the account, you can preview the forms by clicking the Preview link. Define whether the Print Work Order Form will be printed in HTML or Adobe format. The Adobe format is recommended if you will be using batch printing. If using a bar code scanner, check Print bar code on the work order form. Check the Lock Closed Work Orders box if you would like to lock down work orders from being edited once the work order is marked Closed. If you enable this feature you can grant certain Administrators access to reopen Closed work orders to edit them. To grant them access, select their name(s) from the list. Checking Default Estimated Start Date to Today's Date will input the date the work order is created in the Target Start Date field on the work order form.